Welcome to Agilis Fitness, provider of corrective exercise coaching, personal training, semi-private training sessions (small group) and health & wellness coaching for Long Beach and surrounding cities. 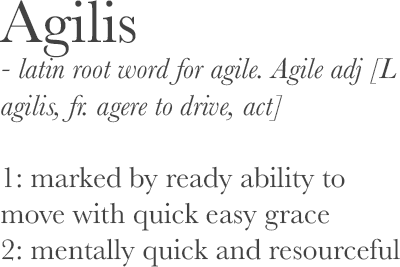 Currently, Agilis Fitness is an in-home, in-office and outdoor service provider of 1-on-1 personal fitness training, semi-private sessions and fitness/wellness consultation. Based out of Long Beach CA, we have the ability to train you in-person in the Greater Long Beach, CA area and we also have an internet/phone consultation service which provides fitness & wellness coaching virtually wherever you are. Our training provides you a thorough fitness screening, program design and implementation with an emphasis on functional training for improved agility, integrated strength gains, kinesthetic awareness and corrective exercises. The fitness assessment includes; range of motion tests for all joints, postural measurements/analysis, metabolic dietary assessment, stress/physiological load assessment and overall daily health habits. Our training not only improves physical agility, posture and performance, it will also improve and sustain your mental agility for when you need it the most! We offer several training packages to fit your needs. Tai chi is also available for those interested in all the benefits this can bring to your training, lifestyle and health goals. Please browse the site and then contact us for a free consultation. This is preventative healthcare at its best! Thanks! And as always, be good to yourself! Interested in our newsletter? Signup and receive useful tips in physical fitness, nutrition, and creating healthy lifestyle habits.